Pepper Hamilton LLP will host the NIABA Board meeting on Friday, November 10th from 11 a.m. to 5 p.m. and from 9:30-noon on Saturday. The firm is also generously sponsoring a cocktail reception on Friday afternoon, following the meeting. Join us for dinner on Saturday night at La Famiglia Ristorante, Philadelphia's best Italian restaurant. Other networking/social events and Thursday & Friday dinners will be announced as they are planned. 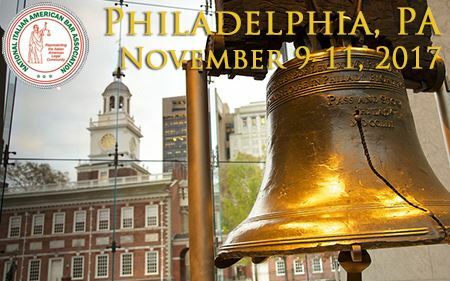 Westin Philadelphia for $189 per night, reservations must be received before October 31. To reserve a room with either a king or two double beds, call Julie Spaziano at 215-575-6908 and mention NIABA. AKA Rittenhouse Square for $225 per night. To reserve a one-bedroom suite, contact Mahika Bega at 215-825-7012 or mbega@stayaka.com and mentioned NIABA. All NIABA members and guests are welcome to attend any of our dinner events. Contact our NIABA Administrator with questions or register now! Sponsorships are still available. Contact Paul Finizio asap!